Growing blueberries in California can be a challenge even for experienced gardeners. Blueberries grow best in acidic soil, and California's naturally alkaline soil must be amended thoroughly before planting and throughout the season. In Northern California, highbush blueberry (Vaccinum corymbosum) varieties do best. In the hot south, rabbiteye blueberries (Vaccinum ashei) are the most heat-tolerate and durable bushes. 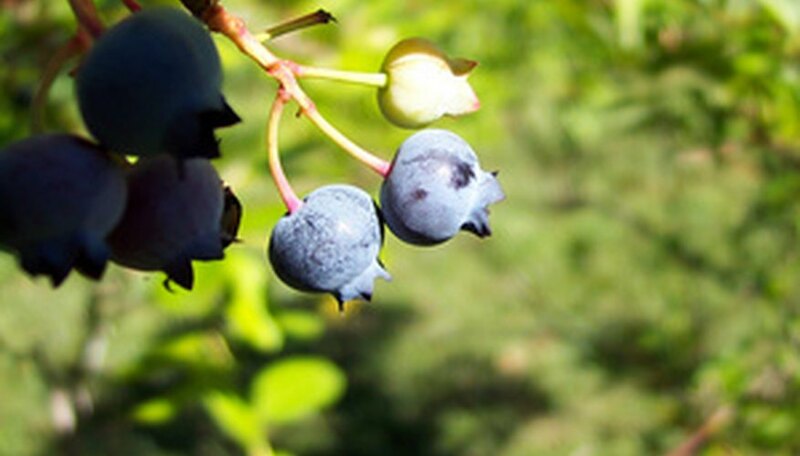 Sharpblue is a highbush blueberry with a low chill requirement, which makes it a perfect variety for most of the northern part of California and in the hills in the south. Although Sharpblue is self-fertile, planting it with another variety such as Sunshineblue will improve its yield. The bushes will grow about 6 feet after 3 years and will reach full production in 5 years. On the coast, plant Sharpblue in full sun. Inland, plant it in a location that is partially shaded during the hottest part of the afternoon. Cape Fear is one of the most prominent highbush blueberries in California and probably one of the easiest to find locally at planting time. Cape Fear has a 500- to 600-hour chill requirement, so it will do better in northern California than in the milder south over winter. The blueberries are abundant on this bush, which reaches approximately 4 feet and will spread over time. Cape Fear bushes are self-fertile and do not require companion planting in order to produce. Powderblue is found throughout the Southeast United States but is becoming popular in the hottest parts of California. It is a late-season rabbiteye that outproduces most other blueberry bushes available. Powderblue will grow to a height of 6 to 8 feet and produce late into the summer. Planting it with a mid-season rabbiteye variety like Tifblue will increase yields for both bushes. Do not interplant only with an early season variety, as they will not bloom at the same time and therefore will not cross-pollinate. Brightwell is an early season rabbiteye that produces abundant medium-sized berries in late spring. It can grow to 8 feet or more and is best interplanted with a mid-season rabbiteye such as Tifblue to increase the crop. Brightwell does especially well in coastal areas of Southern California where humidity can often be a detriment to other blueberry cultivars.